Likud’s chief asset, Prime Minister Binyamin Netanyahu, may also be said to be its chief liability. While unchallenged as preferred prime minister in every opinion poll 17 days before Israel’s general election, his party – the joint Likud-Yisrael Beitenu ticket – is on a downward slide (34) from its first 47-seat rating. Netanyahu’s secretiveness and ambiguity on security and peace, issues which in the last reckoning determine the outcome of Israeli elections and fate of its politicians, are leaving his party unarmed against savage opposition tactics and dividing his own camp. While keeping his undoubted achievements in these fields under his hat, his mistakes and shortcomings are hard to miss. Five months ago, Netanyahu was perceived as suddenly backing off plans to attack Iran’s nuclear program, after declaring for years that a nuclear-armed Iran was the most dangerous threat facing Israel. What happened was that on Sept. 5, he abruptly closed a meeting of the security-diplomatic cabinet on Iran without explanation, except for throwing in their faces that no forum competent to make policy on Iran was safe from press leaks. For most of the country, Netanyahu lost points by failing to go through with this long-held resolve. His cartoon presentation of Israel’s “red lines” at the UN General Assembly on Sept. 27 did not change that perception. He spoke of postponing until “late spring or early summer” an action vital to Israel’s security – apparently in deference to Washington and out of consideration for Barack Obama’s campaign for reelection. Those words had the same ring as sentiments heard from the US president. Common to both is their distance from the facts. 1. The amounts of fissile material claimed by Tehran are unverifiable by Israeli or Western intelligence – or even the International Atomic Energy Agency in Vienna. 2. The interminable wrangling between Iran and the world powers over amounts of medium-grade enriched uranium deemed sufficient for a bomb is no longer relevant because Tehran's consent to “negotiations” with world powers has bought Iran time to acquire the knowhow for assembling nuclear weapons and making them operational. A few kilos of enriched uranium lacking here or there are easily obtainable, either by domestic production or foreign acquisitions. Netanyahu’s graphic red lines, effective at the time, have been overtaken by events. 3. And his five-month silence has persuaded Iran’s rulers that they no longer need fear an Israeli military strike on their nuclear sites. 4. Iran has used those months free of international harassment and Israeli thunder for giant steps toward developing plutonium-based weapons. Netanyahu’s boast that he placed the Iranian nuclear menace at the forefront of the world's platform has had its downside: As the preamble for laying the ground for a proactive military policy, it was effective; however the gap between rhetoric and inaction has harmed Israel’s credibility and damaged its strategic deterrence. A year ago, in January 2012, a number of Western and Arab sources confirmed that Syrian ruler Bashar Assad had transferred a portion of his chemical weapons arsenal to Hizballah strongholds in the Lebanese Beqaa Valley and Hizballah units had trained in their use. Last month, the Defense Ministry’s political coordinator, Amos Gilad, firmly asserted that Syria’s chemical weapons were “under control.” But this did not amount to a denial that those unconventional weapons had come under the joint logistical control of Iran, Syria and Hizballah. It is possible that Netanyahu has opted in some to degree to follow Obama’s lead on security matters with regard to Iran, Syria and Hizballah and Hamas. Even then, he needs to do a better job of offering consistency to the Israeli voter. Instead, he offers silence or, at best, hazy, general messages that perplex the voter and keeps his own party in turmoil. On the one hand, he incurred popular resentment for keeping 50,000 army reservists hanging around for nothing in the November anti-terror Gaza operation. But on the other, his government and party are not cashing in on the credit for the weeks of total calm on the Gaza front since Nov. 21 – the first time Hamas has honored a ceasefire in a decade. Neither is he coming clean on the three additional advantages gained by working with Obama and his collaborators, Egypt, Turkey and Qatar, to negotiate that ceasefire. They could give his party's election campaign a badly needed shot in the arm. One is the improvement in relations with Turkey’s Erdogan government after years of acrimony. It came out of Israel’s consent to support the US president's venture to combine those three nations – plus the Palestinian Hamas – into a new pro-American Sunni Muslim axis. Netanyahu agreed to modify Israel's attitude on Hamas in a gamble for the prizes of rapprochement with Ankara and the stabilization of ties with Muslim Brotherhood-ruled Egypt. Reading this map, the Palestinian Authority, under its Fatah leader Mahmoud Abbas, is stirring up unrest on the West Bank as a reminder to Washington and Jerusalem of his existence. Although when he met the ambassadors in Jerusalem, Netanyahu spoke of the danger of Hamas seizing control of the West Bank like the Gaza Strip in 2007, this was contradicted by his decision to step back from vanquishing Hamas in the November operation. And last week, he opened the Gaza crossing points to supplies of building materials for the first time in six years, as well as cash. The prime minister has a long way to go to bring his right-of-center party around to a policy that embraces Hamas – even though it would help stave off opposition accusations that Israel is diplomatically isolated. Although he has invested considerable effort in thawing the iced-over peace process with the Palestinians, he is constrained from placing this squarely on the party platform because it would not gain a consensus. All the opinion polls, show that, contrary to left-of-center opposition rhetoric, a majority of Israelis don't trust the Palestinians, including Mahmoud Abbas, as partners for negotiations or for peaceful coexistence. Neither do most Israelis subscribe to the international condemnation of Netanyahu’s policy of strengthening Jerusalem and the settlement blocs on the West Bank and the Jordan Valley. The Israeli voter tends to judge every step taken by the government in terms of his and his family's personal and financial security. By keeping the voter in the dark, he is hurting the electoral prospects of his own Likud-Israel Beitenu as a party. And by aligning too closely with Obama on Iran and the Middle East, he is causing the more extreme factions of his party to cross the lines to the religious nationalist Habayit Hayehudi and its new leader, Naftali Bennett. There, they find a clearly-articulated platform calling for independent Israeli stances on the core issues of security, peace with the Palestinians, borders and Jewish settlements. At the opposite end of the spectrum, the left-of-center opposition parties accuse Netanyahu and Lieberman of extreme right-wing, pro-war policies that threaten the country with disaster. Their campaign is turning increasingly savage and personalized rather than issue-oriented. Even though the Likud-Yisrael Beitenu alliance is declining in the polls (down ten seats to 34 in the 120-member Knesset since November), its rivals are battering their heads against the solid support Binyamin Netanyahu enjoys (43+ percent) as favorite for prime minister. The contrast between the declining popularity of Netanyahu’s party and his leadership rating is striking. 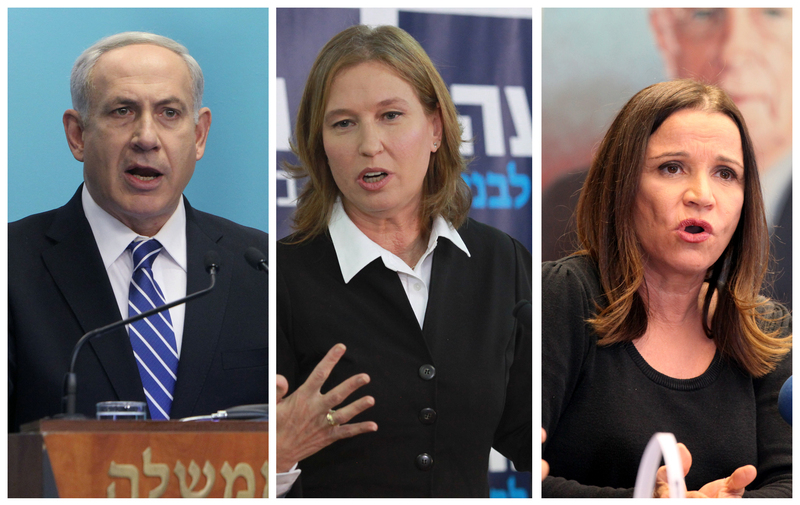 The Likud bloc is followed by Shelly Yacimovitch’s Labor (16 seats), Bennett’s Habayit Hayehudi (14), ultra-religious Shas and the new Yesh Atid (Future) – 11 each; Hatenua founded by former foreign minister Tzipi Livni come next with 10 seats. Friday night, Jan. 4, Livni publicly exhorted Labor and Future leaders to join forces for building a front to prevent Netanyahu from forming the next government after the Jan. 22 election. Pundits estimate that if Hatnua, Labor and Future leaders do manage to forge a common platform (unlikely), they can count on around 40 Knesset seats compared with the right-of-center bloc’s 51. However, the multiplicity of Israeli parties means that no single grouping has ever achieved a parliamentary majority without coalition partners. This situation makes for extreme mobility between the various blocs when the time comes to build a government.